In a bout of fitting timing, I came home from a ride today from Manhattan’s lower east side (up the bike path and across the GWB) to read an article in the New York Times City Section about the current state of cycling in the Big Apple. As is typical for the Times, the article mostly groks the up-and-coming dominance of bikes in the transportation mix of the city and implores people to get along while straying a bit off course to take some digs at “Lance Armstrong types…” on the city streets who don’t obey the laws. As the president of the Rockland Bicycling Club, located in a county that’s popular suburban destination spot for riders who come north of NYC, I’m sensitive to the feeling of frustration when so many cyclists break the law. It’s not a stretch to say that fewer than one percent of riders who pass through our area obey the traffic laws completely, a PR nightmare for our club, which makes a point of obeying regulations on all of our rides. We catch a lot of flack from local officials who feel that cyclists are scofflaws who sprint through lights and weave through traffic. But I bristle a bit when I read an article by a cyclists casting aspersions on a particular class of rider because they are “Lance Armstrong types,” when what they mean is not that the riders are trying to conquer cancer nor that they have won the Tour de France, but that they are obnoxious. This particular paragraph, in the midst of the article’s plea for the city and for motorists to pay more attention to cyclists, caught my eye. 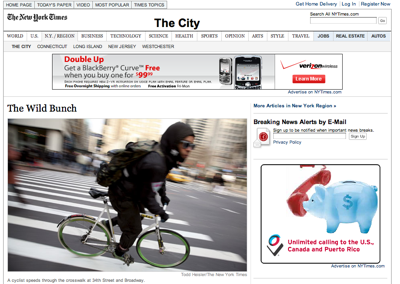 Awesome, a single paragraph defames both me, and the tourists that I passed today while riding in Manhattan. The larger point that the city, and indeed all cities, need to integrate cyclists is a solid one, as is the message that bikes need to obey the laws of the road in order to be granted the rights those laws afford, and makes the article worth reading. Just please, don’t use the fact that I’m wearing a jersey as a reason to belittle me. If you’re on a bike, you’re one of us. It doesn’t matter if you’re a “Really Cool Biker” (another derided class in the article) or a guy on an expensive bike. We’re all trying to get somewhere without a car, and that’s the important part.